Ragnarok is the great battle between good and evil in Norse mythology that will lead to the end of the world. Announced by the Fimbulwinter, three winters with no summers between, it will begin with the breaking lose of Loki, who had been bound, and his progeny, Fenrir, Jormungandr, and Hel. Odin will be swallowed by Fenrir, who will be killed by Odin's son, Vidar; Thor will kill Jormungandr, only to drown in his venom; Tyr will battle the hellhound Garm; and Heimdall and Loki will kill each other. In the end, Frey will fall to Surtr's flaming sword, which will then set fire to the earth and destroy everything except Lif and Lifthraser, who will then repopulate a world of peace and love. The gods will go to dwell in Gimli, and the evil ones to Nastrond; the dwarves and giants will not be punished; and the earth will become the world of men. Description: This knight's sword is mentioned in tales about the end of the world. 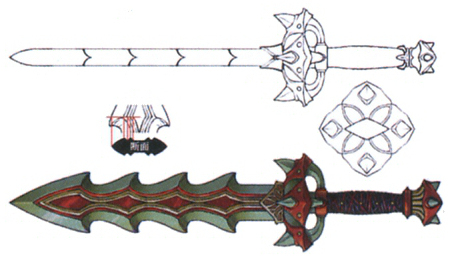 Description: A blade so powerful as to bring an end to a war amongst the gods themselves.